Are encore abstracts eligible for submission? The only encore abstracts that are eligible for submission are ones that have been presented at state or regional meetings. They are NOT eligible if they have been previously published or presented at a U.S. national or international conference. If I submit my abstract to ACC.19, am I allowed to submit it to other conferences or journals? Yes, you are. However, if it is accepted by another U.S. national or international conference, or it is published prior to ACC.19, you will need to withdraw it from the ACC.19 program by no later than January 11, 2019. If it is accepted for publication close to the ACC.19 dates, it is possible to coordinate the date of publication with the ACC Media Relations team and the respective journal so that the ACC.19 embargo policies are not violated. Can I submit a case presentation to the general abstract category? Technically, yes. However, since the general abstract category is meant for scientific research only, case presentations are more likely to receive lower grades from abstract reviewers and are therefore less likely to be accepted. Who can submit to the general abstract category? Anyone is eligible to submit to this category, including high school students and medical students. I am unsure of what category my abstract best fits into – Which category should I pick? As the submitting author, you are the most well equipped for knowing which category your abstract should be submitted to. However, if you would like a second opinion, we recommend reaching out to your colleagues, as they will have more expertise on the subject than ACC staff. Who can submit to the FIT Clinical Decision-Making category? Anyone who is currently a medical student or is in a fellowship or residency program. Any physicians beyond this are NOT eligible to submit to this category. If you do not meet the above requirements, you can work with someone who does, as long as they present the case if it is accepted. Who can submit to the Cardiovascular Team Cases category? Only non-physician CV team members, which could include nurses, advanced practice nurses, pharmacists, physician assistants, CV practice administrators, or technicians. Physicians are NOT eligible to submit to this category. If my abstract is accepted, when will I be notified? All abstract submitters will receive a notification of their acceptance status the week of December 17, 2018.
Who will be notified if the abstract is accepted? The only person who will be notified of whether or not your abstract is accepted is the presenting author for that submission. If my abstract is accepted, will it be published? Yes, it will be published online in the ACC.19 JACC Abstract Supplement prior to the ACC Annual Scientific Session. What is the fee for abstract submission? Can this be waived? The fee is $45 for all general submission categories, including Abstracts, Cardiovascular Team Cases, FIT Clinical Decision-Making Cases, and Interventional Challenging Cases. This fee cannot be waived. Due to demand, the abstract submission deadline is 1:00 PM ET on Thursday, October 18, 2018. Are there example abstract submissions I can see? Yes. We provide examples for the following categories on our Annual Scientific Session site: Cardiovascular Team Cases, FIT Clinical Decision-Making Cases, and Interventional Challenging Cases. If you would like to see examples of abstract submissions, you can view them in the ACC.18 Abstract Supplement of the Journal of the American College of Cardiology by clicking here. How do I complete my disclosures? Visit https://disclosures.acc.org and log in using your ACC username and password. If you do not have an ACC username, you can create one for free on that page. Do all co-authors need to complete their disclosures? No. Only the presenting author and lead investigator are required to complete their disclosures. If a person is both the presenting author and lead investigator, then only they need to complete their disclosures. Does the Lead Investigator need to complete their disclosures in order for the submission to be complete? No, they do not. The only person who must complete their disclosures in order for an abstract to be complete is the submitting author/presenting author. If the abstract is accepted, ACC will follow up with any lead investigators who have not disclosed. Is there a maximum number of authors that can be on an abstract submission? Yes, the maximum number of authors that can be on a single submission is 25.
Who should I list as the Lead Investigator for my abstract? Generally, the Lead Investigator is the senior author of an abstract, but sometimes the presenting author will list themselves as the Lead Investigator as well. Can I change who the presenting author is? Yes, you can. To do this, log back into the submission site, click on the submission you want to make the change to, and go to the "Author" tab on the left-hand side of the screen. There, you will see the option to "Change who is Presenting" underneath the author names. Can I change the order authors are listed? Yes, you can change the order of all co-authors, except for the first author. To do this, log back into the submission site, click on the submission you want to make the change to, and go to the "Author" tab on the left-hand side of the screen. There, you will see the option to "Change the Order these Author(s) are listed" underneath the author names. Why can't I change who the first author is? The system automatically makes the submitting author the first author because they have completed their disclosures. If you would like to make someone other than the submitting author the first author, you will need to have them first complete their disclosures and then you will need to contact Annual Scientific Session staff to have them change the first author for you. Why is there an "N/A" displayed next to my name as the first author on the "Author" tab? Why is my institution information missing? The first author will always have "n/a" displayed to the right of their name. This is normal and does not display anywhere else other than on the "Author" tab. Do NOT enter your name more than once to enter in your institution information since institution information is entered in on a separate tab. Is there a maximum character count for a submission? Yes, the maximum character count per submission is 1,900 characters NOT including spaces. If you choose to add an image or table to your submission, it will count as 600 characters towards the total 1,900 characters that are allowed. Do the section headers in the body of my submission count towards the total character count of my submission? Yes, they do, and they cannot be removed. Please account for the section headers in your abstract's total character count. If I am using commonly known abbreviations like TAVR or STEMI, do I need to include them in my 5 unique abbreviations? No, you do not. Commonly known abbreviations do not need to be counted towards the 5 unique abbreviation limit and they do not need to be written out in their entirety upon first use. I have a table I want to include with my submission. Can I only add it by entering the information into the table function on the submission site? No, you can also add it by uploading an image of it. The easiest way to do this is by taking a screenshot. You can do this on a Windows computer by using the snipping tool and you can do this on an Apple computer by hitting Command-Shift-4. Am I required to include references in my Cardiovascular Team Case submission? No, you are not. If you have no references to add, simply put "—" in the text box and if your abstract is accepted, the section will be removed from the published version of your abstract. How do I know my abstract is complete? All tabs on the left-hand side of the submission site will have checkmarks next to them and the "Review My Work" tab will have a message saying, "Your submission is complete and will be sent to review." You will also have the option to send yourself a confirmation email that your submission is complete at the top of the "Review My Work" page. This option will only appear if your submission is complete. Am I able to save a copy of my abstract? Yes. You can save a copy of your abstract by logging into the submission site, clicking on the submission that you want to save, and then going to the "Review My Work" tab on the left-hand side of the screen. On the top of that page, you will have the option to print your abstract for your records. Can I make edits to my abstract after the submission deadline? No, you cannot. Per ACC policies and procedures, no edits can be made to abstract submissions after the submission deadline. This includes adding author names or correcting errors in data. Please carefully review your submission prior to the submission deadline to ensure all co-authors are listed and all information is correct. I can't find my original ACC.19 faculty invitation. Is there an easy way for me to access it? Yes. You can access your invitation(s) by visiting the ACC.19 Portal and clicking on the "Tasks" tab at the top of the page. I accepted my invitation but am no longer able to come. Who should I contact? Please contact annual meeting education staff to let them know. You can find their contact information on the summary page of your invitation. Will staff register me, or do I need to register myself? You must register yourself. 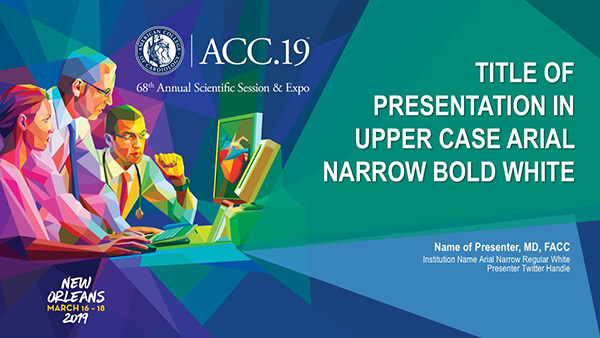 You can register for ACC.19 by visiting the registration page. I tried to register for ACC.19, but it tells me I must pay. I thought that as a faculty member I get free registration? Yes. As a faculty member you receive complimentary registration. However, you must wait until 24 hours AFTER accepting your invitation(s) before you can register for free. Who's considered faculty and who's considered a contributor? Please view the ACC.19 Education Participant Types. As a faculty member, do I receive anything besides complimentary registration? No, you do not. The ACC does not pay an honorarium, nor reimburse for hotel, travel, or per diem expenses for ACC.19 faculty members. I require a visa to come to ACC.19. How do I receive documentation to get it? Once you register for the conference, you will be able to obtain official documentation to get a visa. For more information, visit our International Travel and Visa Information page. You can make a hotel reservation through the ACC.19 site. To see which hotels are available, visit our Hotel Options page. To complete your disclosures, visit the ACC's Disclosure Website and log in using your ACC username and password. If you do not have an ACC username you can create one for free on that page. I already completed my disclosures, but I keep getting emails to update them. What's the problem? It could be one of two things. The first issue could be that your disclosures are currently up-to-date, but will expire before ACC.19, so our system is registering you as noncompliant. To make sure everything will stay current through ACC.19, go to your disclosure library and click on "I agree for the next 12 months" next to each of your three ACC agreements and then on "I Agree & Confirm" at the bottom of the page. This will update all disclosures and agreements under your account. The second issue could be that you have multiple accounts with the ACC and the account you are updating is not associated with your faculty role. Please contact our resource center at resource@acc.org or (800) 253-4636, ext. 5603 to see if you have numerous accounts. If you do, they will assist you with merging the accounts and they will contact annual meeting staff to ensure your correct account is associated with your faculty role. My title just says, "Case Presenter." Who comes up with the cases? As a case presenter you should work with the session chairs to develop an appropriate case. If you need the chairs' email addresses, you can find them on the summary page of your invitation under the "Presentations" header. I would like to make a slight adjustment to my talk title. How do I go about doing that? You can put in a request to change your talk title by emailing education staff. Upon receiving your request, they will reach out to the session organizers for approval, and if the session organizers approve the change, education staff will make it for you in the system. What do I need to do to prepare for my presentation? That depends on your specific role within a session. Chairs, Presenters, and Panelists all have different responsibilities within a session. Please refer to the summary page of your invitation(s) to see what type of role(s) you have and the associated responsibilities. We will also send out more detailed information about this in February. I want to contact the other faculty in the session. How do I get their contact information? After accepting your invitation, you will be taken to a summary page. That summary page lists all session details, including other presenters within your session and their email addresses. You can find this under the "Presentations" header on the summary page. Is there a presentation template for ACC.19? Yes. Download the ACC.19 presentation template. Is the presentation template required? No. However, we strongly encourage you to use the template to create continuity between presentations and sessions at ACC.19. I arrive on Friday p.m. and my talk is at 8 a.m. on Saturday. Is this enough time to check my PPT in the Speaker Service Center? Yes. If you arrive at the Speaker Service Center by 6:30 a.m. on Saturday and you explain to the staff that your presentation is at 8:00 a.m., they will make every effort to ensure that you are ready on time. What time does the Speaker Service Center open each day of the meeting? The Speaker Service Center opens at 6:30 a.m. on Saturday and Sunday, and it opens at 7:00 a.m. on Monday. I have never spoken at ACC before. Who selected me for this talk? The sessions are organized by our ACC.19 Program Committee. Therefore, one of our Program Committee members selected you as faculty. As a poster presenter, do I need to register and pay for the conference? Yes, all poster presenters must register in their correct registration category and pay the corresponding registration fee. Am I allowed to change who the presenting author is? Yes. You can change who the presenting author is up until ACC.19, but if you want the change to appear in publications, you must do it prior to January 11, 2019. Now that my abstract is accepted, do all co-authors need to complete their disclosures? No. Only lead investigators and presenting authors need to complete their disclosures. If you change who the presenting author is for your abstract, you must ensure they complete their disclosures by going to https://disclosures.acc.org. In the online JACC supplement for ACC.19, which will be published on onlinejacc.org. When will my presentation be embargoed until? Monday, March 4, 2019 at 8 a.m. ET. I am no longer able to attend. How do I withdraw my abstract from the conference? Please contact Robin Young at ryoung@acc.org and include the control number for your abstract in your email. If my abstract was accepted for publication prior to ACC.19, do I need to withdraw it from the conference? Yes. However, if it will be published close to ACC.19, you can contact the media relations team to see if you are able to coordinate the publication date with them. When is the last day I can withdraw my abstract without it appearing in publications? My flat-board poster session time is listed as 3 hours long. Do I need to stand next to my poster that entire time? No. Each flat-board poster session is 3 hours long so that meeting attendees can visit the poster hall and view posters at their leisure. Poster presenters must stand next to their posters for 45 minutes during that 3-hour period. Session 1: Poster display time: 9:30 a.m. – 12:30 p.m. Poster presenters attend their board: 10:00 a.m. – 10:45 a.m. Session 2: Poster display time: 1:30 p.m. – 4:30 p.m. Poster presenters attend their board: 3:45 p.m. – 4:30 p.m. Session 1: Poster display time: 9:30 a.m. – 12:30 p.m. Poster presenters attend their board: 9:45 a.m. – 10:30 a.m. Does my poster need to stay on display for the entire 3-hour long session? Yes. Posters must remain up for their entire designated 3-hour period so that attendees can view them at their leisure. Is there a poster printing service available for ACC.19? Yes. The poster printing service is fulfilled by Call4Posters and is highly recommended by the ACC. Posters ordered through this service are picked up directly onsite in the ACC.19 Poster Hall. Place your order today to take advantage of this service. What is the poster board size for flat-board posters? Poster boards will be 4 feet high and 6 feet wide. Please plan to make your poster slightly smaller than those dimensions to ensure it fits properly on the board. Will there be materials available onsite to hang up my poster? Yes. Thumbtacks to hang up your poster will be available next to each poster board in the poster hall. If I am presenting a flat-board poster, do I still need to upload an ePoster to the ACC.19 ePoster viewing system? Yes. ePosters are a requirement for ALL poster presenters, including flat-board poster presenters. If I am presenting a moderated poster, do I need to print out a physical poster as well? No, you do not. You only need to create a pdf or ppt version of your poster and upload it into our ePoster system by Thursday, February 28, 2019. What is the format of moderated poster sessions? All moderated poster sessions will take place in front of a live audience in each pathway's moderated poster theater located inside the Poster Hall. Poster presenters will present their abstracts for 10 minutes on a plasma screen, followed by a 5-minute Q&A. They will use an iPad to control the movements of their poster on the screen. Two poster moderators will also be at each session to help guide discussion. What time will moderated poster sessions occur each day? 8 poster presenters attend their screens: 10:00 a.m. – 12:00 p.m.
3 poster presenters attend their screens: 3:45 p.m. - 4:30 p.m.
3 poster presenters attend their screens: 9:45 a.m. – 10:30 a.m.
5 poster presenters attend their screens: 12:30 p.m. – 1:45 p.m.
3 poster presenters attend their screens: 3: 45 p.m. – 4:30 p.m.
Am I able to practice with one of the session iPads prior to my presentation? Yes. You can practice for your presentation using an iPad by either visiting one of the moderated poster theaters when a session is not occurring or by visiting the Speaker Service Center in the Lounge & Learn Pavilion. I'm giving an oral presentation. What does that mean? If you are giving an oral presentation, it means you will be giving a PowerPoint presentation in a regular classroom in front of a live audience. The exact length of time and format varies depending on which type of oral session you are in. You can find more information about your specific session by viewing your original acceptance notification. If I'm giving an oral presentation, will my abstract still be published? If you are presenting an Abstract or FIT Clinical Decision-Making case, then yes. If you are presenting an Interventional Challenging Case, then no. How do I access the ACC.19 ePoster submission site to upload my poster? Log into the ePoster submission site and upload your poster. You will need your ACC username and password to access the site. Can I upload an ePoster if I am a co-author for an abstract? No. Only the presenting author will have access to the site to upload their poster. You must log in under the presenting author's account to access the site. Are there ePoster templates available to use? Yes. We provide templates on our ePoster submission site. However, templates are not required and you are welcome to use whichever poster template you prefer. Do I need to include my abstract submission on my ePoster? No. Although you need to include all the information from your abstract submission on your poster, you do not need to include a specific "Abstract" section on it. Do I need to include disclosures on my ePoster? What dimensions should my ePoster be? Dimensions can vary, but all posters should be in landscape orientation. If you are presenting a moderated poster, the screen you will present on is 70 inches with a 16:9 aspect ratio. If you are presenting a flat-board poster, the board will be 4 feet tall and 6 feet wide. Are ePosters a new requirement? No. In an effort to enhance our attendees' experience, we have made ePosters a requirement for all abstract presenters since ACC.15 so that attendees can view posters virtually. Are ePosters required for all abstract presenters? ePosters are required for ALL flat-board poster and moderated poster presenters. Why is the deadline to upload ePosters so early? We have the deadline two weeks before the conference so we have time to contact authors if there are any issues with their posters. Can I change or update my ePoster after the deadline? Yes. You can replace your original ePoster submission up until the conference. However, we need to have some version of your poster by February 28th so that we can ensure it displays properly in our system.